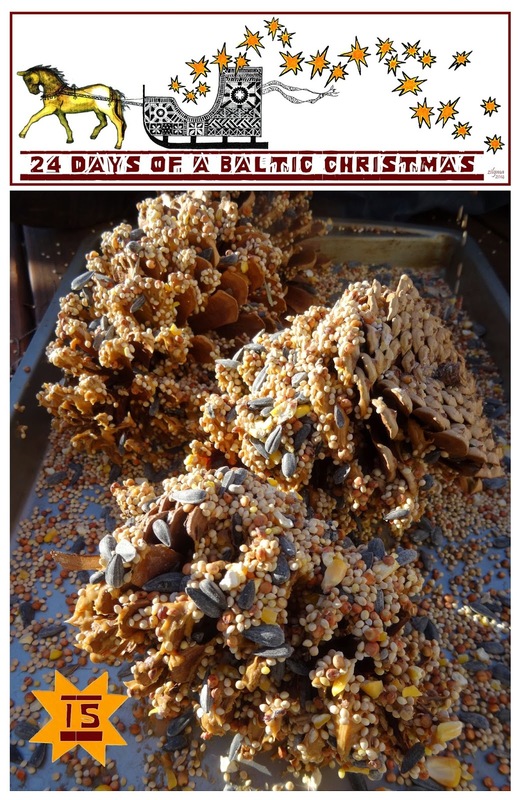 Today on 24 Days of a Baltic Christmas we discover the beauty of decorating with nature’s bounty and make birdfeeders with pine cones! Inviting nature into the home is a recurring theme not just for Christmas, but many of the Baltic holidays. 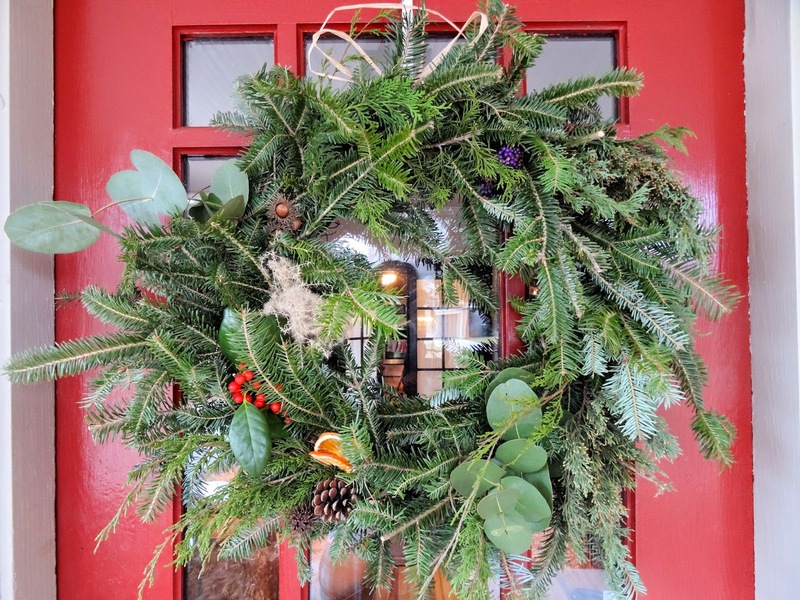 Latvians weave wreaths from conifer branches to celebrate advent, hang garlands of greens throughout the home and decorate their Christmas trees with straw and other natural ornaments. For our family, living in the southeast means decorating our home with branches of holly from the backyard and sprigs of mistletoe gathered from the enormous oaks in the neighborhood. The boys gave me an amaryllis bulb this year that has slowly been shooting greenery up preceding the unveiling of its showy red flowers. Even the fruit we eat this time of year serves to colorfully decorate the table: pomegranates, tangerines and cranberries among the last apples of fall. It is also tradition to decorate the exterior of the home, and although Christmas lights are modern favorites, the customary decorations are not giant blowup Santas, nor are they plastic reindeer. The time-honored decorations are found in nature, the beauty of the forest brought to your door. We made our own wreath this year, using plants found in South Carolina. Notice the purple beautyberry, the red holly berries, the (naturalized) sawtooth oak acorns and sweetgum seeds. 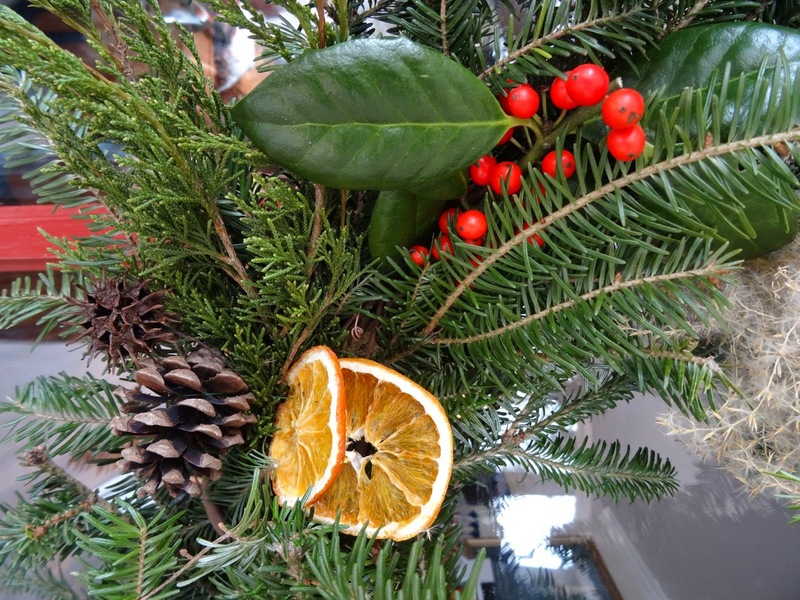 Orange slices can be dehydrated in the oven to make colorful additions to a wreath or garland. Another of my favorite ornaments for use in the outdoors are pine cones. 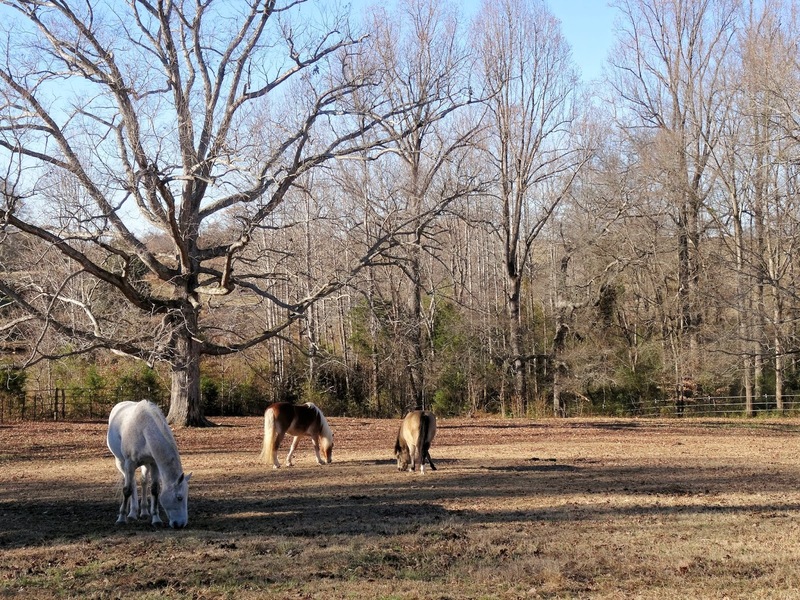 We were visiting a friend and discovered a horse pasture full of longleaf pine cones – large, round, with sturdy scales, perfect for our uses. Do note many species of pine (including longleaf) have cones with armed umbos – this means there is a sharp projection at the scale tip of seed-bearing cones. But this just means a little attention must be paid while working with the cones. Using string or craft wire one can wire cones into their wreaths, or hang them from a Christmas tree. 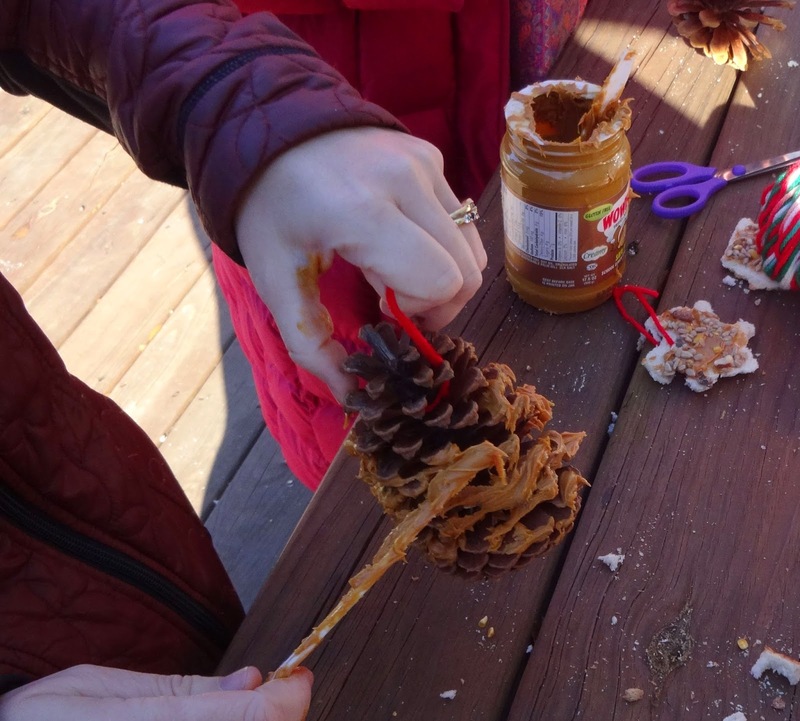 Our favorite pine cone activity this year was to make birdfeeders. Materials needed include: a pine cone, peanut butter, birdseed, string. 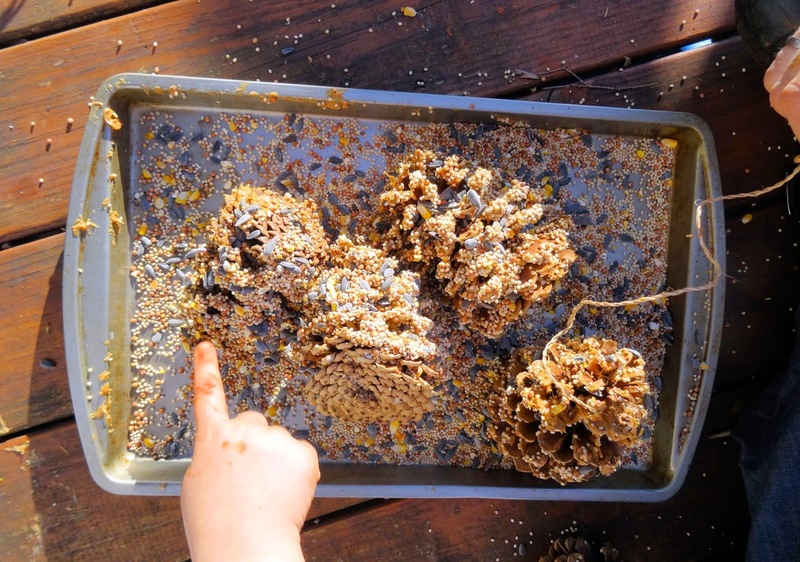 The kids spread the peanut butter on the pine cone and then roll in the birdseed, after which the parent helps tie a string around the tip of the cone to hang it from a tree for the neighborhood birds to enjoy. If you can't find pine cones try using a piece of stale bread and a cookie cutter, as on the table in the picture above. Such an easy project, but the results are still pleasing to the eye. However you choose to bedeck your home these holidays, remember to keep your eyes open as there are materials everywhere! Whether they be dried grasses or flowers found on an evening stroll, fallen acorns, seeds or pine cones from the tree down the street, or simply a branch from a tree or shrub in your backyard, the simplicity of natural decorations is an integral part of a Baltic Christmas. Day Sixteen on 24 Days of a Baltic Christmas – more on Christmas trees and their decorations and DIY puzuri!